Every store needs a point of sale for completing transactions. 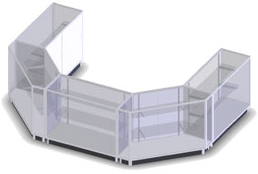 Our cash wrap counters can help you to create a professional looking checkout area that will meet the specific needs of your shop. 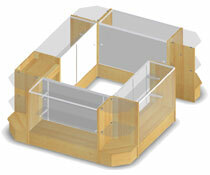 These C-shaped configurations include display cases and register stands that can be arranged in many ways. Each fixture features recessed tops to hide cords as well as drawers for storing supplies. Cash wrap counters act as a convenient area for customers to write checks and discover new merchandise. These cabinets are ideal as all-around centerpieces with their attractive design. Use our cash wrap counters as a focal point in your outlet both while showcasing for your finest products. Why are these point of sale cases great for retail stores? Our cash wrap counter layouts consist of different pieces to create an all-in-one centerpiece. 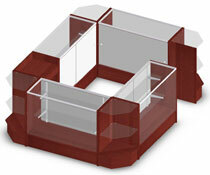 Use these high-visibility display cabinets to feature merchandise where everyone can see it. Components are available in many different styles, including full, half, and quarter vision cabinets. Our display case definitions article will help you understand the meaning behind these industry terms. Each unit is made with strong tempered glass that's made for durability. Both our cases and register stands are made of laminated particle board and come in a number of finishes. We offer black, white, maple and cherry shades to go with any interior. Alternatively, our furniture made out of aluminum has a sleek silver finish that gives shops a modern look. These checkout counters have ample storage space with easy access to your merchandise. 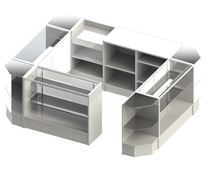 Display cabinets have a large showcase area with clear shelving. Each one has locking doors, a great way to make wares visible while keeping them secure. Our retail fixtures feature an area in the back to store supplies out of sight. 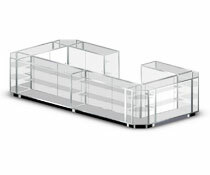 Store counters are easy to assemble, getting your shop set up as soon as possible. Most of these checkout fixtures can be put together by one person. Larger cabinets, like our 6' wide models, will require at least two sets of hands. All of our retail furniture includes instructions to make assembly a breeze. 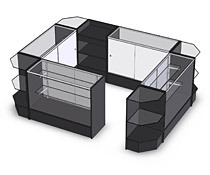 Retail fixture configurations are available in a number of shapes to fit in any outlet. Use enclosed rectangles to showcase products to all sides. U-shapes are ideal for placement against a wall, while L-shapes can cover a shop corner. 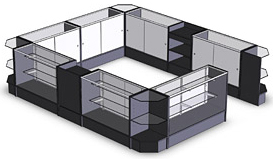 These layouts can be rearranged and separated to the configuration that suits you best. How can these commercial fixtures make great points of sale? In large department stores, our centerpieces can securely showcase high value merchandise. Feature watches, jewelry, electronics and anything else that deserves its own shelf near the cash register. Customers will easily see these wares while cashiers will be close by to answer questions. In small shops, these commercial merchandisers are often placed by the entrance to process transactions. This is ideal for getting customers to see high value merchandise just as they walk in as well as prompting them to make last-minute impulse purchases at check-out.